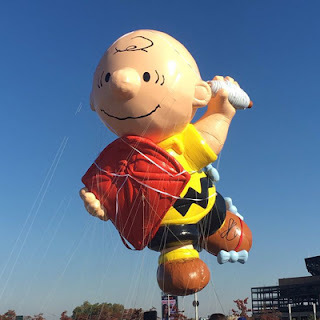 After watching last year’s Macy’s Thanksgiving Day Parade, and anticipating the oversized balloons of our pals Snoopy and Woodstock, I wondered about the Peanuts balloon legacy in this annual celebration. I quickly discovered that information was both scarce, and frequently inaccurate. In the interests, then, of providing an authoritative chronology of the association between Macy’s and the Peanuts gang, I spent considerable time researching the topic. The goal was to find and provide an absolutely accurate listing, at all times cross-checked with photos and news coverage from reputable sources. • New York City’s famous Macy’s Thanksgiving Parade began in 1924, complete with live animals borrowed from the Central Park Zoo. The live animals were replaced by large balloons, beginning in 1927. 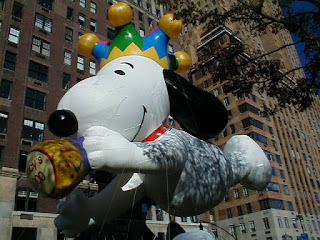 • Snoopy, in various personas, has been in this parade more than any other character. 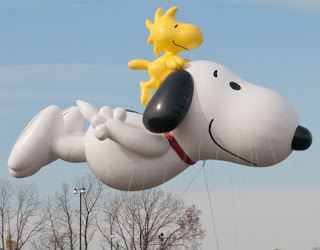 • The average height of the large balloons, like our pal Snoopy, is roughly six stories. • The ground-based balloon handlers must weigh at least 125 pounds. 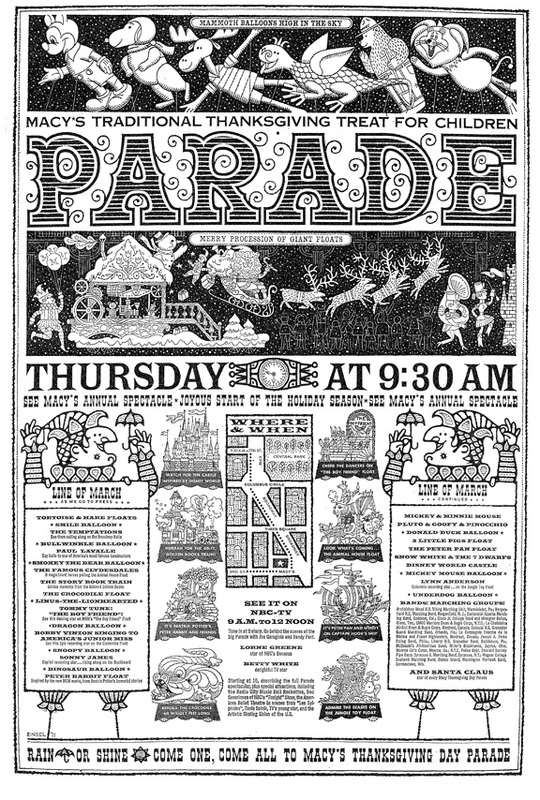 • For many year's, Macy's promoted the parade with detailed, full-page newspaper ads that sometimes even listed the scheduled balloons and floats. • Until 2011, the floats and balloons were built in a former Tootsie Roll factory in Hoboken, New Jersey. The parade construction facility then moved to a larger warehouse in Carlstadt, also in New Jersey. • During the very early hours of parade day, everything travels through the Lincoln Tunnel, to get to the parade’s starting point in Manhattan. Once there, the balloons are inflated with a mix of helium and outside air, just a few hours before the parade begins. 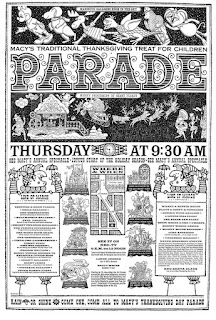 • These days, roughly 2 million spectators line the streets of Manhattan, to view the parade. The event lasts approximately three hours, and covers two and a half miles. The big moment for Peanuts fans came when Snoopy debuted as a giant balloon in 1968, in the 43rd parade. This first incarnation was as the WWI Flying Ace, complete with a green aviator cap and brown goggles. Astronaut Snoopy was featured through 1977, inclusive, although he was unintentionally missing in action twice. All the balloons were grounded in 1971, due to excessively strong winds. 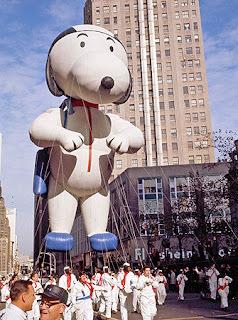 Snoopy fared a bit better in 1975, making it partway through the parade route, until he and two other balloons were grounded, again due to heavy winds. Starting in 1978, and continuing through 1986, inclusive, Snoopy once again resumed his WWI Flying Ace persona (the original 1968 balloon) … but this run was fraught with peril. Snoopy missed the 1980 parade due to a “broken leg.” These large balloons are built with separate chambers, so that the entire balloon is not affected by damage to one part, such as a leg. Even though he could have flown, his appearance would have upset his fans. Snoopy was back in the parade in 1981 … but with what looked like a giant garbage bag acting as a band aid on the damaged leg. For unknown reasons — as research has indicated — Macy’s chose not to include Snoopy in either the 1984 or ’86 parade. A new balloon, Snoopy the Skater, was launched in 1987. Our cheerful beagle sported a black and red scarf, with a matching ski cap, complete with white trim and pom pom. He seemed quite pleased to be “skating” down the parade route on bright red skates. His outfit changed the following year. Bright red earmuffs and a Macy’s branded sweater were added to this “Skating Snoopy” balloon. His pal Woodstock also joined the fun, wearing his own red and white ski cap. This same year, Charles M. Schulz’s adult daughter, Jill, skated on the MetLife Peanuts Ice Rink Float. This balloon, with earmuffs and sweater, continued to skate through the skies, along with his pal Woodstock, through 1995 … with one unfortunate exception. 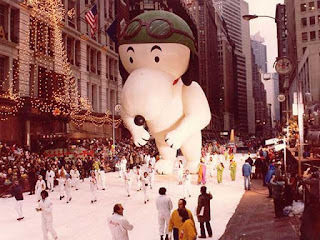 Snoopy’s nose was accidentally punctured in 1989, so he missed that parade. 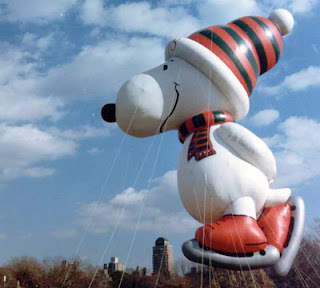 Bewilderingly, Macy’s decided not to include Snoopy in the next three parades: 1996 through ’98. The World Famous Beagle’s fifth persona arrived in 1999, as Millennium Snoopy — complete with jester hat and horn — helped ring in the upcoming New Year. Millennium Snoopy returned in 2000 and ’01. In a novel twist, Snoopy was replaced by Charlie Brown — and his football — in 2002. Good ol’ Chuck continued to try and kick that football through 2005. 2006 temporarily retired Charlie Brown, while debuting a new and improved version of Snoopy as the WWI Flying Ace. His cap and goggles were much spiffier, and he also sported a bright red scarf and binoculars, for spotting the dreaded Red Baron. 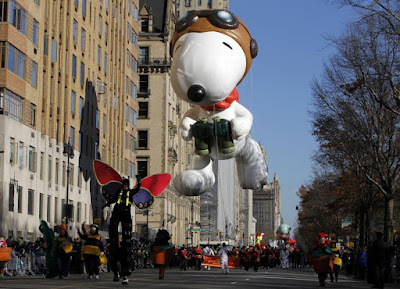 This Flying Ace continued to patrol the skies over the Manhattan parade route through 2011. 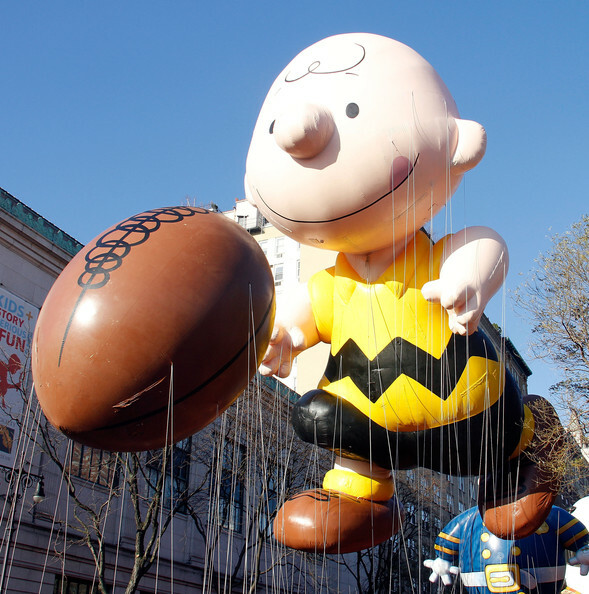 Charlie Brown and his football made another appearance in the 86th annual parade, in 2012. 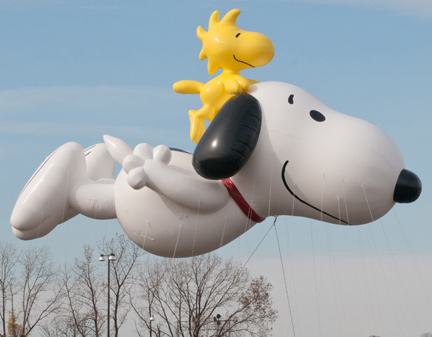 The seventh version of Snoopy’s balloon counterpart arrived in 2013, and has continued to appear through 2015. He’s back to his plain beagle self, floating horizontally with Woodstock on his head. Fans continue to see Charlie Brown in the parade. The eighth - and current - Peanuts balloon is our round-headed friend, flying his kite. So far, he has appeared in the 90th annual parade in 2016, in the 91st parade in 2017, and again in the 92nd parade in 2018. That’s the state of affairs, to this point. We’ve no idea what the future has in store for our inflated Peanuts pals; stay tuned for the next parade. Speaking of past parades, a number can be viewed in their entirety — including fun glimpses of the Peanuts balloons discussed above — at this YouTube Channel. Fantastic read. Thanks for posting!